We are not the government’s website or affiliated with the government agencies but independent Vietnamese visa agency. Our mission is to bring you convenience and give you full support for Vietnam visa service. We work closely with governments and their agencies in order to ensure a smooth and transparent process for our clients. Visa on arrival and e-visa are issued by the Vietnam Immigration Department, therefore they are totally legitimate. You will only be charged a fee for visa service. There is no hidden fee guarantee. You will receive 100% money back if the visa on arrival can not be done. 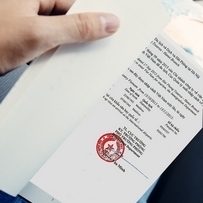 Vietnam visa on arrival: longer staying, simple process, for multi purposes! Step 4: Get visa stamp at immigration counter at arrival airport after paying the stamping fee. You can skip getting in lines with the visa fast track service. At present, Vietnam tourist visa is popular at the validity of 1 month and 3 months, especially the United States of America citizens can apply for 1 year multiple entry tourist visa with 90 days stay each visit. 1 year business visa will give you an uninterrupted stay for 12 months without leaving the country in the middle. How to get e-visa for Vietnam? From 1 February 2017, the citizens from 81 countries are eligible to apply for the 30 days (single entry) e-visas for Vietnam. In order to apply for e-visas, the visitors are required to complete an application form, pay the fee 42 USD and receive the e-visa via email after 3 – 5 working days. Who should use e-visa for Vietnam? – Connect to the visa application form and select “Apply electronic visa” option to fill in application form, upload photo and copy of passport. – After 3 – 5 working days from all documents are submitted and visa fee is paid, we will process and deliver your e-visa via email. You then print out the visa, bring along with your original passport, photo and obtain visa stamp at arrival airports. 3. Visa on arrival or e-visa? - Urgent: No urgent service is available! - 9 seaports across Vietnam. Step 4. Get visa stamped at Vietnam airport upon arrival by presenting original passport, photos, entry and exit form and stamping fee in cash. Step 1. Connect to the visa application form and select "Electronic visa for Vietnam"
Step 4. You then will be provided with a digital code to check the application progress and print the e-visa once it has been issued. Why should you choose visa on arrival? You will have 24 x 7 support from us after you submit your visa application. We will care for your entry until you got your visa successfully.